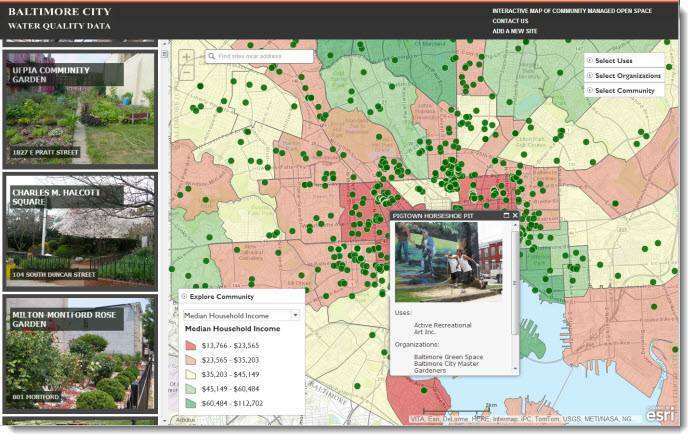 Blue Raster enabled BNIA-JFI (Baltimore Neighborhood Indicators Alliance-Jacob France Institute) to setup and launch their new interactive map for community gardens and open spaces in Baltimore with ArcGIS Online Accelerate. The Interactive Map of Community-Managed Open Space assists city residents in discovering natural spaces they can protect, claim, and effectively use for their community in an urban location. Take a look at this video to see the site in action. The site also allows users to search by address or garden, view gardens by categories and submit pictures. ArcGIS Online and Flickr API allowed five different organizations – Baltimore Green Space, Parks and People, Master Gardeners, the Johns Hopkins Center for a Livable Future and Baltimore City’s Power in Dirt project – to aid governmental and non-governmental agencies synchronize “greening activities”. The Interactive Map of Community-Managed Open Space is helping local groups across the city preserve uncluttered space.